California condors are the largest flying birds in North America, with a wingspan of nearly 10 feet. Native Americans call them thunderbirds, believing they bring thunder to the skies with the beating of their tremendous wings. Once ranging from British Columbia to northern Baja California, Mexico, condor populations declined to as low as 22 individuals in the 1980s. In 1986, the U.S. Fish and Wildlife Service captured the remaining birds from the wild, placing all hope for species recovery in captive breeding and release. 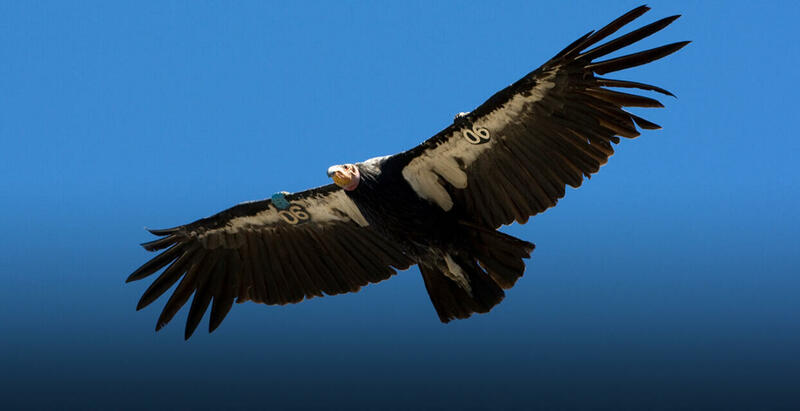 Through careful breeding by the San Diego Zoo Safari Park and our partners, guided by the work of our Conservation Genetics team, sufficient numbers of chicks were produced to allow the first releases of California condors back to the wild in 1992. Over time, the number of breeding institutions expanded to five and the world’s population of condors grew to more than 400. Today, over half of these birds are flying free at five wilderness release sites in California and Mexico. Our Recovery Ecology researchers work closely with Mexican partners to manage the California condor reintroduction program at the Sierra San Pedro Mártir Condor Field Station. Studies in our Disease Investigations show that the main obstacle preventing condor populations from becoming viable in the wild is lead poisoning resulting from ingestion of ammunition fragments in carcasses left by hunters. Ingested lead is absorbed into the blood stream, causing gastrointestinal and nervous system problems that can result in debilitation and death if left untreated. In an attempt to reduce the exposure of condors to lead, our field team provides lead-free food subsidies to the condors at all release sites. Routine feeding has the added benefit of giving researchers opportunities for periodic re-trapping of wild individuals to conduct health inspections and treat condors for lead exposure when necessary. As condor populations continue to increase in the wild and their home ranges expand, an ability to forage naturally and avoid collisions with wind energy farms are factors that our scientists are addressing. In Recovery Ecology, we are developing new technological solutions to prevent bird collision injuries from wind turbines, and are experimentally encouraging the exploratory foraging behavior of birds to entice them to feed more naturally on coastal food sources at the release site we manage in Mexico. In Reproductive Sciences, we are studying environmental contaminants in the marine environment that may have a negative impact on condor reproduction. Our Conservation Genetics team developed the first test for carriers of a lethal disease in condors and is using it to identify breeding pairs at risk of producing affected chicks.